Celta Vigo made a couple of changes from their thrilling 3-3 draw with La Liga newcomers Girona, opting for a 4-2-3-1 instead of a 4-3-3 – with Daniel Wass dropping from central midfield back into right-back with Hugo Mallo moving to the bench. Striker Maxi Gomez joined him, with Iago Aspas moving from the wing into the central striker slot with new arrival Emre Mor given his first start on the right wing. One thing that became clear early on in the match was that despite keeping the ball well in defence and aiming to dominate possession, Las Palmas struggled to move the ball forward with any real consistency. This is reflected in the match stats – Las Palmas had 59% possession, with a total of 499 passes in the match. Of those 499, the centre-back pairing of Bigas (63 passes) and Garcia (57 passes) made a total of 120 (24% of the teams total) passes between them. Celta Vigo actively encouraged this and must have highlighted this as a possible weakness to exploit. They dropped deep, giving the Las Palmas defenders time on the ball and used their shape to cut off the passing lanes into midfield. This lead to Calleri often being isolated up front, aimlessly chasing long-balls or receiving no service at all, again demonstrated by the stats with Calleri touching the ball just 34 times, the lowest of his team (apart from goalkeeper Chichizola who had 33 touches), and 12 less touches than Aspas (46 touches) who was up front for Celta Vigo, despite Celta Vigo having significantly less possession. Celta Vigo’s game-plan was almost faultless. They’d wait unless possession was won and then counter-attack at speed, with Pione Sisto and Mor the key players, and I was highly impressed with both of them. I’ve been a long-term admirer of Sisto, and he demonstrated why superbly. Whenever he picked up the ball he’d take numerous Las Palmas players out of the game, either by dribbling to the by-line and passing back into the space he created – or driving in-field with the ball and drawing numerous players into him before releasing the ball to a team-mate in space. 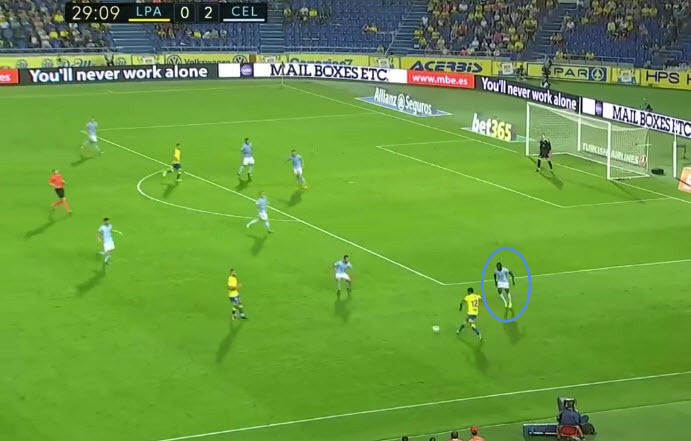 It was this latter move that particularly caused Las Palmas problems, which was demonstrated for Celta Vigo’s second goal, where Sisto got the assist for Aspas first goal of the night. Sisto’s fleet-footedness kept the Las Palmas defence guessing, with him often cutting inside and back out, quickly taking a shot – posing an unpredictable goal-threat as well as creating 2 goals. Emre Mor was another that impressed me – making his first La Liga start, plenty of attention would be on him, but he showed a level of game intelligence that I wasn’t ready for. It was this intelligence that helped him open the scoring after just 15 minutes played, where he expertly found space in a dangerous area on the edge of the box. Wass was able to find him, allowing Mor a simple left footed finish to open his tally for the season. The match finished 5-2 to Celta Vigo, with Aspas in fantastic form, netting himself a hat-trick. Las Palmas looked to be given a lifeline when Ruben Blanco (the Celta Vigo goalkeeper) got himself sent off for a rash challenge, but instead of helping the struggling Las Palmas, Celta Vigo went and scored 2 more goals after the red card. Las Palmas finally got their first goals of the match in the 90th minute, but by then the damage had well and truly been done. I’d be worried for Las Palmas as they looked a far cry away from last seasons campaign under Quique Setien. They looked significantly better however when Loic Remy was introduced and I wonder whether switching to a 3 at the back system would help utilise their strengths more. Celta Vigo, in contrast, have developed a fantastic young team, along with the players I mentioned earlier, I think the acquisition of Stanislav Lobotka has been a brilliant signing and combined with the experience of some of the older heads like Wass and Hernandez they make for a solid team who could very well have a superb season.